The Triple “R” Threat: Rest, Renew, and Restore!!! Greetings from YFL!!! Come in and kick the heat with some Triple “R” at YFL!!! This week we focus on physically restoring, renewing, and relaxing!!! Our Sanskrit focus is “Moksha Hum”, which affirms that our true self is always in a state of “freedom”. Pure awareness is free of limitations. Our mudra is “Panava”, or the gesture for connection to our deeper self and meaning, or “self realization”. It promotes inner growth via disciplines such as meditation and yoga. The meditation focus is “Be still”, and may be contemplated while listening to the music selection for this week, “Claire de Lune”. Meditation I begins today for 5 weeks, from 11 a.m.-Noon. We look forward to meditating with all of the registrants!!! I am excited to announce that Kim will be offering Reiki I training again in September. She just completed Reiki II training at YFL yesterday. 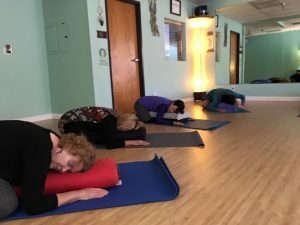 Sophie’s quarterly “Yoga for Grief” workshop will also return in September. The Sound Bathing concert with Betty and Peter is coming soon!!! It will be offered on 8/25, from 1-3 p.m., @ $25. Space is limited, so sign up quickly!!! This entry was posted in Uncategorized on July 9, 2018 by Deb Potts.